I’m hoping to get my halfling player on one of these soon! I was given one by another player and purely for aesthetics we're saying it's an Alaskan Malamute. I'm in love. Can i as a gloom stalker purchase one of these for a guard dog or perhaps even as an animal companion? I have a Gnome Paladin with Find Steed. She summons a mastiff using the spell for her mount. 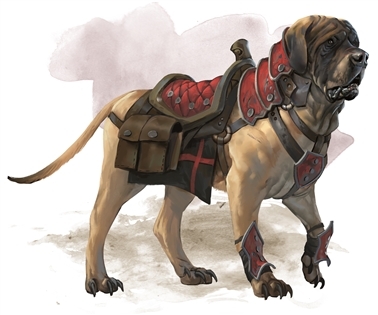 Can Mastiffs also be companions and not just mounts? Are there other creatures that can be used as mounts for halflings and other small humanoids? I mean, you could use a pony (the other medium option summoned by Find Steed), and basically any medium-sized quadruped is theoretically rideable. For example, a small-size Beastmaster ranger riding a pterodactyl or panther, or a goblin astride a trained wolf. Outside of class/spell-granted creatures, it's basically a question of what animals the DM will let you buy and/or train. My Kenku Ckeric has a mastiff to protect her from all the cats out there-because they're TERRIFYING! I'd think so. You dont ride your horse all the time, or at least I didn't. And you'd develop more of a kinship with your dog, so that seems reasonable to me.